Once the relay became known as a device, it was not long before engineers realized that there were other applications for contact relays. If you could use a relay to relay a contact closure into an isolated circuit in order to restore the voltage levels then you could also use a relay to relay a contact closure into an entirely different circuit with an entirely different voltage type and level. In other words, using a switch that supplies, for example, 24 volts DC to the coil but have the contacts switching 480 volts AC and switching heavier contacts to handle much higher currents. So, you are basically controlling a high-voltage, high-current device with a low voltage, low current device. The most dominant feature of a relay is the coil. The coil is also the load in the switching circuit. It is wound around a pole piece which is a rod of ferromagnetic material. The coil and the pole piece constitute an electromagnet. 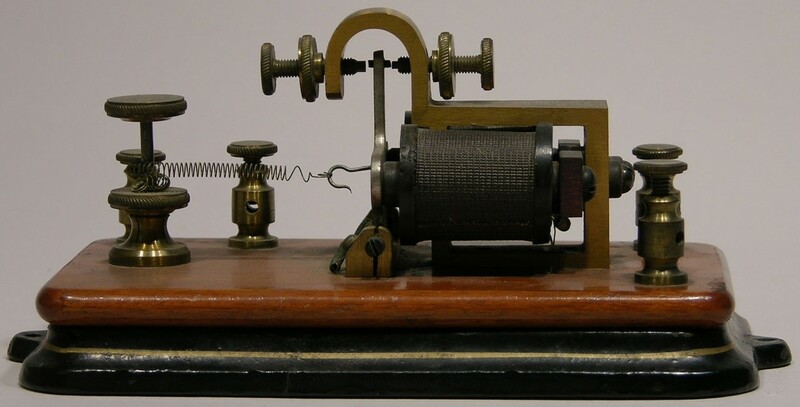 The object of the electromagnets affection is the armature which is another piece of ferromagnetic material that is suspended near one end of the coil by a spring that would oppose the magnetic field. Attached to the armature is a moving contact, its travel is restricted in each direction by stationary contacts. When current flows through the coil, the armature is drawn to the pole piece of the coil against the tension of the spring. As the armature travels towards the coil, the moving contact travels as well coming to rest against a stationary contact. 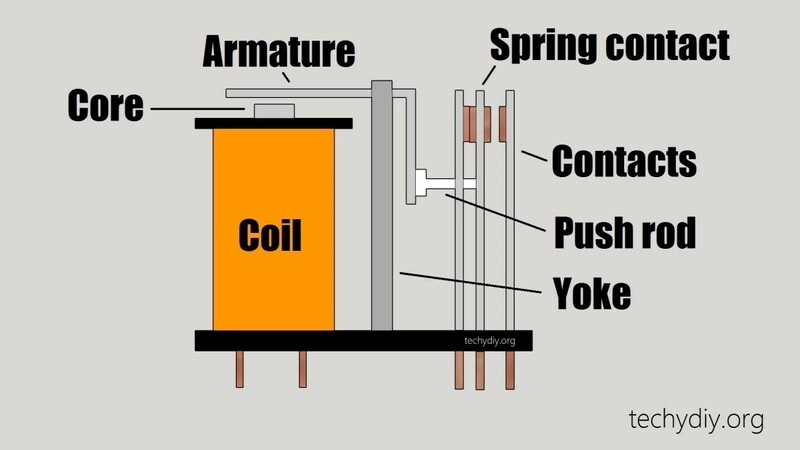 When the circuit containing the coil is opened in the coil de-energized that is turned off, the magnetic field collapses and the spring tension is now the dominant force and the armature and the moving contacts attached to it move away from the pole piece. The movement away from the coil is limited by a stationary contact and the movement towards the coil is limited by a stationary contact. So, as power is alternately applied to the coil, the moving contact makes contact with the two stationary contacts, one contact when the relay is de-energized and the other when the coil is energized. The programing language used to create or write programs for a PLC is based upon relays circuit symbols. The original relay control panels use relays for the logic and the most common programming language for PLCs, the ladder logic. For example, in the application, we will use three public interfaces to the circuit. The first one, single pole, single throw switch that is operated by the operator, the second is the indicator that is seen by the operator and the third is also seen by the operator. So, the operator has access to control the switch and then those indicators indicate conditions in the circuit. The power supply, the relay, and the DC power supply would not be visible to the operator. The circuit that controls the relay is powered by alternating current. A single pole, single throw switch is used to both complete the circuit to energize the relay coil as well as to open the circuit to de-energize the coil. The normal state for a relay is de-energized hence the upper set of contacts are normally closed and the lower set of contacts are normally open. With a single pole single throw switch in the open position, the relay is in the normal state and the normally closed contacts complete the circuit from the DC source of power to energize the load. Read more on this page. When the single pole single throw switch is closed, the current flows through the relay coil generating the magnetic field. When the normally open contacts close, they close the circuit for the DC source of power to energize a different load. You could say that his relay relays the state of the single pole single throw switch in the AC circuit to the normally open contacts in the DC circuit. The normally open contact of the relay matches the state of the single pole single throw switch. The components of a relay that are of interest to the control system are the coil, the normally closed contacts, and the normally open contacts. 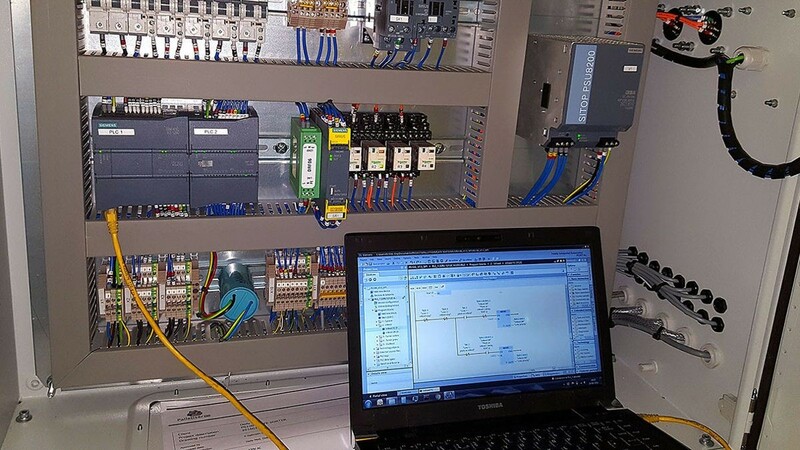 This circuit has all the basic components of an industrial control system: an input device, the switch, output devices, the indicators, and the power sources to control the output devices by means of the input device. There is a set of conditions that much be met to energize the relay coil. Instead of a single switch to control the relay, there is more than one contact that must be closed to energize the relay coil. The state of relay coil then becomes a collective representation of true of false condition.